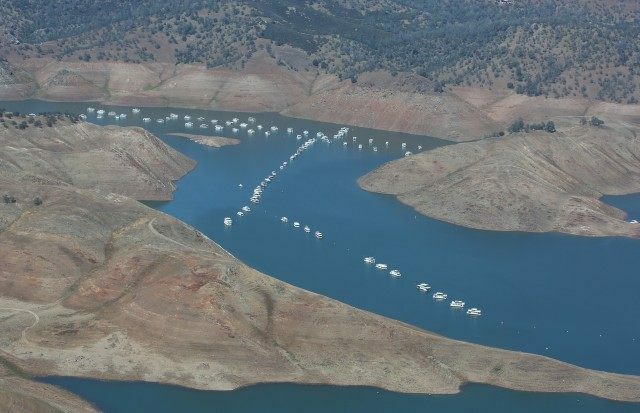 The footage, taken from flights over Folsom Lake, Lake Shasta and Lake Oroville on July 20, reveals dwindling water supplies at three of the state’s largest reservoirs. Lake Oroville, California’s second-largest reservoir, sits at just above 50 percent capacity as scant rainfall and virtually zero Sierra Nevada snowpack combine to add more strain to the state’s devastating water shortages. Relief may be coming soon, in the form of a wet winter via an El Niño. In May, scientists at the National Climate Prediction Center raised the possibility of El Niño to 90 percent. But some water officials say that even a “super El Niño” wouldn’t be enough to pull the state out of its record drought. Check out DWR’s aerial footage above.